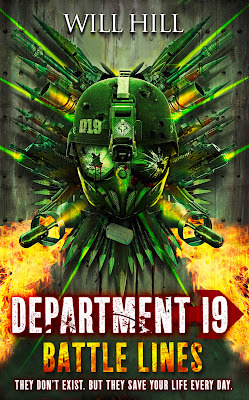 Today is release day for Department 19: Battles Lines by Will Hill (you can see my review here). Now, thanks to the generous people at HarperCollins and The Big Shot you have the chance to win a set of the three Department 19 books that have been released to date, simply by filling in your details in the form below. The first name drawn at random after the closing date will win the three books. The deadline for entries is 7pm BST Friday 5th April. This competition is open to UK residents only. Back in January I ran my annual 'Coming Up In...' feature. 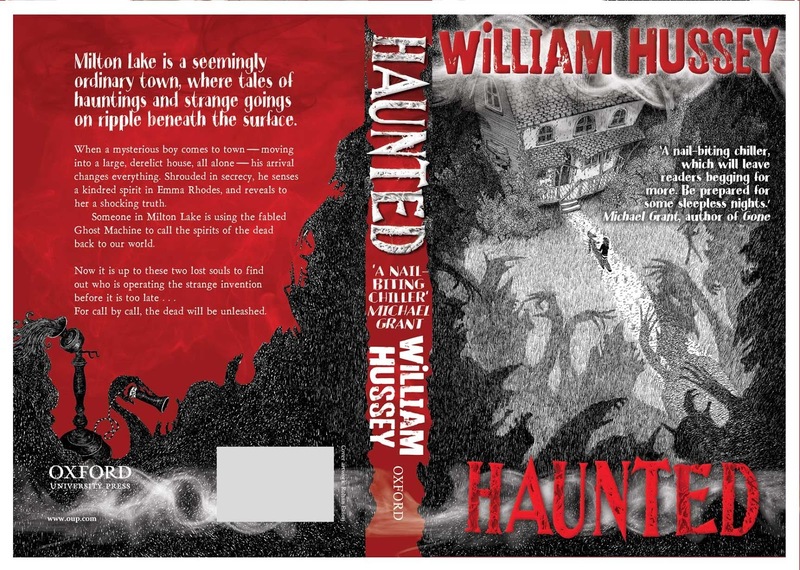 At the time, Witchfinder author William Hussey expressed an interest in taking part, but he really wanted to wait until the book cover had been finalised by the lovely people at OUP. Naturally, as a lover of William's Witchfinder series, I was desperate to find out more about his new book, Haunted, and so I have been waiting patiently for the moment to arrive. And now it is here, and not only do I have the honour of hosting a fantastic guest post by William, but also the very first public reveal of the book cover for Haunted (so remember where you saw it first). It is a little different from most of the YA covers around at the moment, and I totally love it! Rohan Eason's illustrations are so incredibly spooky, and I could stare at the image for hours (and as the book isn't due to be published until September I'm just going to have to make do with this for the next few months). Make sure you click on the pictures to view the images in all their big sized glory. After completing the Witchfinder trilogy, I was really keen for a new storytelling challenge. Witchfinder had been pretty epic: a story that spanned over a quarter of a million words, virtually every monster in the mythical bestiary, and a timeline that started a moment or two after the Big Bang and reached right up to the present day (by way of the Stone Age and the English Civil War!). Now I wanted to write a story with a tighter focus, a tale that concentrated on a few characters over the course of a week. I’m a great believer that writers should always be challenged by their next project. They ought to step into those early pages of a new book with their hearts lodged firmly in their mouths. ‘Can I really do this?’, ‘Am I good enough to pull it off?’ Those questions should forever be ringing in the writer’s mind. With HAUNTED I set myself two formidable (for me, at least!) challenges. First, I would tell the tale from the point of view of a sixteen-year-old girl. Up until this point, I’d always written my books from a boy’s perspective; could I really capture an authentic voice for a teenage girl? As I got deeper into the story, I began to realise that I shouldn’t always be conscious of the gender of my hero, Emma Rhodes. What did I know about this character? She was clever, strong-willed, determined, resourceful, grieving, robust and yet sensitive, especially to cruelty and injustice. Those were the things that mattered about her, and they were characteristics I admired and felt able to convey. My second challenge was to introduce a ‘celebrity historical cameo’ into the book. The Ghost Machine is an antique telephone from the 1920s, its crackling line a pathway to the world of the ravenous dead. But here’s the thing: the Ghost Machine is based on a true story. 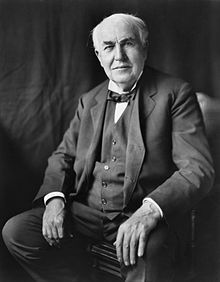 In 1920 the world-famous inventor Thomas Edison – the man who developed the light bulb, the movie camera, the telephone and the record player – claimed to the world’s press that he was on the verge of inventing a phone for speaking with the dead! No kidding, he really did! After his death ten years later it was thought that Edison had been pulling one of his famous pranks on a bunch of gullible journalists… but what if he’d been telling the truth? Why would Edison have covered up such a fabulous invention? What might have caused him such mortal terror that he hid the device from the world? And what if the Ghost Machine was still out there, waiting for some desperate soul to start making calls on it again? Once I’d hit upon the idea of the Ghost Machine in a modern setting (with Emma battling to discover its whereabouts before it tore her world apart), I knew that Thomas Edison himself must feature in the story. What followed is essential for any writer hoping to recreate a historical setting and personality: LOADS of research. I read four HUGE biographies on Edison, as well as several books on the development of early telephones. Once I’d absorbed all my notes, I was ready to write the chapters in which Edison revisited his famous Menlo Park laboratory and, at dead of night, began his experiments with the Ghost Machine. Research helped to make this ‘character’ seem real to the reader. I had to recreate the way the Great Man spoke, how he moved, how he thought, how he listened (tricky as Edison was almost stone deaf!). I had set myself this challenge before when writing Witchfinder: Gallows at Twilight, which featured the real historical character of Matthew Hopkins, the Witchfinder General. But in that case I was helped by the fact that very little is known about Hopkins, and so I could create the character pretty much as I wanted him. With Edison, I felt a huge amount of pressure to get the real man down on the page as faithfully as I could. Of course, the real Edison never experienced a night of supernatural terrors, as he does in HAUNTED, but I had to know enough about him as a character – his history, his family, his strengths and prejudices – to make the scene seem as genuine as I could, both for readers who had no clue about the historical Edison and for those who knew his life inside out. It was a terrifying challenge, but one I absolutely relished! So what more can I tell you about HAUNTED? Well, here are a few teasers: we have a Circle of very unlikely and very ruthless necromancers (or ‘conjurers of the dead’); a haunted house once owned by a mass murderer; a deserted theme park in which a decidedly grisly ghost decides to manifest; a troubled boy with a secret so surprising it will (hopefully!) take your breath away; a hero who faces her grief and terror only to discover one devastating revelation after another; a school library like no other; an antique shop harbouring the most terrifying wonders the world has ever seen; a collector of bric-a-brac who will chill the very marrow of your bones; a mystery that goes to the heart of Emma Rhodes and blurs the line between the worlds of the living and the dead; and a nerve-shredding finale so spooky it made Michael Grant (of GONE fame) lose sleep! Is that a phone ringing in the next room…? No, it’s OK, I’ll wait here. 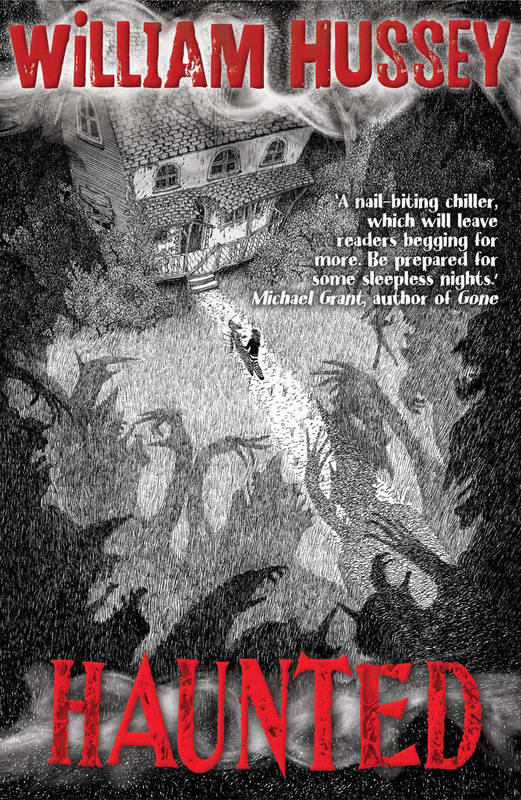 A note on the cover: this is the first EVER reveal of the HAUNTED cover, especially for the brilliant Book Zone. The artist is the very talented Rohan Eason, whose previous work includes The Wolves of Willoughby Chase. What we all wanted from this cover was a very stark fairy tale vibe to go with the gothic spookiness of the story. Lyrical black-and-white imagery contrasting with the red lettering fitted the bill perfectly. I love how the ghosts – or the ‘unmade’ as they are known in HAUNTED – swirl around to frame Emma as she ventures towards the Sparrow House. At the beginning of this year I made the decision to pull back from taking part in the majority of blog tours that were offered to me. I mentioned this briefly in the introduction to the piece that Barry Hutchison wrote for me yesterday, and I said I would explain a little more today. I have a number of reasons for doing this. Firstly, I'm really not sure they are worth doing. I look at the hits my posts get, and author interviews and outside of blog tours and my reviews of their books seem to be far more popular with my readers. Secondly, sometimes authors are visiting a huge number of blogs in these tours, and expecting them to produce high quality, original pieces for every blog is a huge ask. In a few of the tours I have participated in in the past I have almost felt disappointed with the copy I have been sent when I compare it with the work that author normally produces. And another, albeit less significant reason, is that when I visit other blogs I really hate seeing a side bar rammed full of blog tour banners. 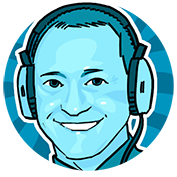 If I look back through the blog tours I have participated in, author interviews are by far the most popular items (although there are a number of guest posts that have been incredibly well received). I would love to be able to say I would do a Q&A for every blog tour invitation I receive, but I will only do this for books I have read, and more often than not I simply do not have the time to guarantee a read of a book before the tour is scheduled to take place. However, occasionally a book will come along that I will TOTALLY LOVE, and if this coincides with a blog tour then I am more than happy to take part, and thus I have left that door slightly open. One such book is Rat Runners by Oisin McGann. I absolutely raced through it, and so did not hesitate at all to accept Random House's kind invitation to take part in the tour by interviewing Oisin. Firstly, how would you describe your book Rat Runners to a potential reader? I tend to describe it as a crime story set in a near-future surveillance state. The idea is that these young criminals, the rat-runners, can do a lot of things that adults can’t, because of the massive surveillance system you become part of once you turn sixteen. When four of these rat-runners are hired by a powerful psycho gangster to find a case belonging to a murdered scientist, it doesn’t take them long to realise they’re involved in a very dangerous game played by some very powerful people. The kids are smart, tough and very fast on their feet, but way out of their depth. What was the original inspiration behind the Rat Runners story? It started with a very simple idea: What if, instead of all these surveillance cameras we see around us every day, there are masked, uniformed figures watching us instead? Because that’s what’s actually happening, when you think about it. You’d suddenly get a lot more paranoid. I then cranked it up, so they don’t just watch you, they can examine you with X-rays and thermographic sensors, highly sensitive mikes and chemical analyzers. And there are plenty of other forms of surveillance out in the streets and online too. Then imagine that kids can’t be tracked until they were sixteen, so a lot of kids end up being used by criminals for certain types of jobs. Imagine the types of kids they’d be. And they still have to avoid the surveillance, so you have an excellent means giving those kids a real advantage over a lot of adults. You also keep the action inventive by stopping villains from carrying guns and obvious knives – because they can be spotted by X-ray cameras – and just moving from place to place can become an action scene. Then I decided to make this the whole surveillance thing the setting for the story, rather than having it as the problem to be solved. The characters aren’t trying to bring down the system, they’re just living and working within it. I loved your main characters in Rat Runners. Can you tell my blog readers a little more about Nimmo, Scope, Mannikin and FX? They’re very different from each other, with a variety of motives and goals, and different ways of doing things, and this allowed me to have them sparking off each other throughout the story. Nimmo is the master thief, a loner with trust issues, whose first concern is always survival, but who has a code of sorts. He has few friends, but is loyal to those he has. Manikin is a con-artist and a frustrated actor. A student of human nature, but also prickly to deal with, she was being raised for a life in film before her parents died and the performer ended up living off her wits with her younger brother FX in the criminal world instead, putting her skills as an actor to use, changing her appearance and personality at will. FX is a coffee-addicted fidget and an expert hacker and tech-head. He’s a bit of an online anarchist too, and though he lets himself be pushed around by his big sister, he’s a genius when it comes to anything digital or electronic and runs most of the things in their hideout in Brill Alley. Scope is also a child prodigy, with a passion for science and an eye for detail that borders on obsessive-compulsive. She makes a living faking forensic evidence for a gangster. She seems the most innocent of the rat-runners, but has lived for too long in the control of that monstrous gangster to have any illusions of the criminal world. What kind of research did you do when writing Rat Runners? There were all sorts of things I needed to cover, from some of the different types of confidence trick to police procedures, from forensics to London’s geography, from hacking to action for social justice – and a lot about surveillance techniques. But I’d read a lot about this kind of stuff anyway, as I’m interested in it, and I’d written a darker, more serious book called Strangled Silence a few years back about how information is controlled and distorted, which had a lot of common elements. Most of what went into Rat Runners was just material I’d picked up along the way, rather than finding it specifically for the story. That said, I could rarely go more than a few pages without checking something. It’s part of the fun of writing, getting to read about stuff for work that you’d do anyway. Rat Runners is full of all kinds of tech. How much of it is real and how much of it was a product of your imagination? Actually, the vast majority of it is real, although I did enhance it in places, such as fashion for implants and the Safe-Guards’ ability to use X-ray cameras on the move. Apart from the brundleseed – which is based loosely on a theory, but nothing that actually exists yet – just about all the technology I mention is already in use. In fact, I actually had to tone it down in places, as the reality of surveillance is so overwhelming, I could spend the whole book trying to cover all the details. But that wouldn’t make a good novel – too much description really slows down the pace of a story. And it’d probably make my readers paranoid. Although you are writing about a fictional future police state, is the book intended to be a commentary on the present levels of surveillance in the UK? I suppose it’s more about asking questions than any deliberate kind of commentary. I’ve found when I’ve tried to make statements or try and explain things with a story, the writing can get very preachy, which is never good, and also, I’m just not that smart that I can figure it all out. But I do have questions. Every story is a thought process – my mind is in among those words, mulling it all over, but the first aim is always to produce a thrilling plotline. If the reader keeps thinking about stuff in the book after they’ve finished reading and put it down, that’s a bonus. Certainly, I think we should be asking ourselves how much surveillance we want in our lives, and how much of our privacy we’ve already surrendered to people we don’t know and shouldn’t trust. You produce small illustrations for all of the chapter headings in Rat Runners. How did this come about? Could you tell us something about the process you go through when creating these? Rat Runners works as a standalone story. Are you planning to write any more books featuring Nimmo, Scope, Mannikin and FX? Absolutely, I’ve outlines for two other books so far. I’ve also done a short prequel, a novella entitled The Eyes Behind Glass, that’ll be published as a free ebook, and possibly in episodes online. Who are your greatest literary influences? Where do I start – there are so many! Certainly, when I was young, there was Richard Scarry, Dr Seuss, and Enid Blyton, then Roald Dahl, CS Lewis, Willard Price and then Tolkien. I wanted stories about monsters and detectives, soldiers and spies, nastiness and humour, cool vehicles and chases and fights and thrills. I loved Jules Verne, who was just so far ahead of his time, classics like The Adventures of Tom Sawyer, Treasure Island, Watership Down and Masterman Ready, and I read a lot of science fiction and fantasy, but as I got older, Stephen King was probably my biggest influence. He isn’t just a horror writer, he’s a fantastic writer of any kind of story. There were comics writers like Pat Mills, Frank Miller and Alan Moore. I read westerns by Louis L’Amour, Len Deighton’s war stories and cold war thrillers by the likes of Craig Thomas, John le Carré and Tom Clancy. Later influences would include writers like Ray Bradbury, Michael Crichton, Neil Stephenson and Ernest Hemingway. Nowadays, I like Iain Banks, China Mieville, Chuck Palahniuk, George MacDonald Fraser, Lee Child and Terry Pratchett among many others. The books you have written include elements of fantasy, science fiction and crime thriller. Are you a fan of all of these genres as a reader? Yes, though I like to read all sorts of things, and I’ll try anything once. Why did you decide to write for the Young Adult market? A writer wants to have an effect on their reader, and the writers who had the greatest effect on me were those I read in the first few years of reading novels, when I was able to understand complicated plots and the difficult issues a character could be faced with, but my imagination was still free – I wasn’t worried about tax, or politics and I wasn’t watching the news. I wanted to do for other people what those writers did for me. I just that would be the biggest buzz, and it is! There is also one major advantage in writing for young adults, and that is you don’t get pigeon-holed. If I write a crime thriller, a science fiction story, a fantasy story, a historical drama and a horror, they’ll all get shelved together. If I were writing for adults, they’d all be put in different sections, on different shelves. And besides, I consider a young adult book to be a story both young and adult readers can enjoy. Which books/authors did you read as a child/teenager? How do you think they compare with the children’s/YA books available today? I’ve covered most of those in my answer about my influences, but back then, there were no ‘Young Adult’ books really. You went straight from Enid Blyton, Willard Price or The Hardy Boys to adult books. Really, the only difference between a lot of YA books and adult books of the same genre now is that the YA book has to have a young person as the main character, although I think that has more to do with what grown-ups think kids want. When I was young, I didn’t really care what age the characters were. Actually, I wanted to read about adults a lot of the time, not kids. So in Rat Runners, the kids live as adults, taking care of themselves because that’s the world they’ve found themselves in. If you could pose one question to any writer, living or deceased, who would the writer be and what question would you ask? I suppose it would have to be my dad, who wrote a lot of non-fiction. He died back when I was in college. I think I’d just like to have a chat about books, now that I’ve gone from being the kid who filled copybooks (exercise books) with stories and pictures, to doing it for a living. That’d be a cool conversation to have. Thank you for your time Oisin. Is there anything else you would like to say to readers of The Book Zone? Just that it doesn’t matter what you read, as long as you’re reading what interests you, excites you, whatever floats your boat. It’s not the format you read the words in, it’s how it sets your imagination playing, and the experience it creates in your head. Reading is just the means to the end – it’s what enables the DVD player in your head to turn books into movies. I hope you read Rat Runners, and I hope you enjoy it. Huge thanks to Oisin for taking the time to answer my questions, and I am so glad I used my 'no blog tour get out clause' to host this Q&A. 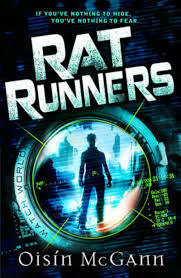 Take it from me, Rat Runners is a superb, fast-paced hi-tech crime thriller set in an all-to-believable future Britain. Rat Runners was published at the beginning of March, and you can continue your journey with Oisin on this blog tour tomorrow at Book Passion For Life. "What's a blog swap?" I hear you cry. It is an idea that Barry Hutchison, friend of The Book Zone and children's author extraordinaire, came up with whilst we were chatting on Twitter recently. I told him that I was pulling back from taking part in blog tours as a general rule (although exceptions will be made - come back tomorrow to find out more) as a) I hated visiting other sites and seeing a lengthy column of blog tour banner after blog tour banner and b) I'm not sure they are particularly good anyway (again, I'll explain more tomorrow). It’s not all fun and games being a children’s author, you know? Oh sure, I might be jetting to the Bahamas one minute, and enjoying a hot tub with the cast of Hollyoaks the next – but it’s not always like that. Actually, it’s never like that, but let’s pretend it is. So when I’m not being pursued by soap starlets, signing autographs and accepting Hollywood film offers, what does a children’s author do? In my case, I get death threats. At least, I did for a while, and today I’d like to tell you all about them. First, let me set the scene. It’s October 2011. I’m all excited about my new novel, The 13th Horseman, which is due out in February 2012. It’s my first standalone novel, and a complete departure from my Invisible Fiends horror series, being a comedy adventure about the end of the world. I put the poster image up on my website. A few hours later I get a comment on it from someone cryptically calling himself “skdbpf”. It reads simply: “not funny” – no capitals, no punctuation, just that: “not funny”. Which, you know, is absolutely fine. Everyone’s entitled to their own opinion, and I’ll be the first to admit that it’s hardly side-splitting stuff. “Gently amusing” as I said. Emphasis on the “gently”. Again, no capitals (not even on Jesus, which I’d be quite annoyed at, if I were him. Er… Him). The meaning of the comment took a few seconds to fathom out, but I got the general idea. 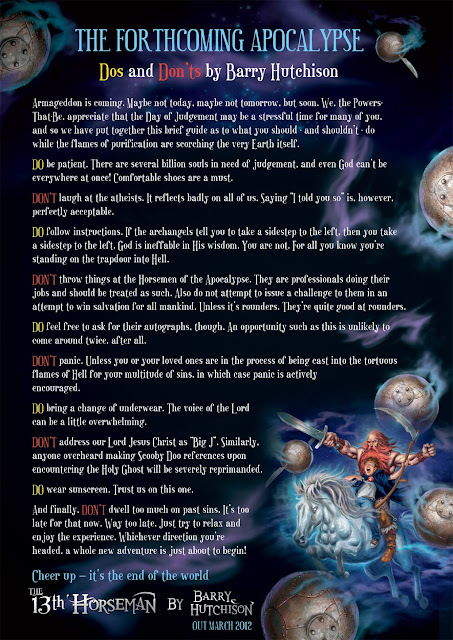 I had caught the attention of a semi-literate religious zealot, and tempted as I was to get involved in a public debate on it, I spammed the comments and thought no more of it. Until the death threat arrived a few days later. It was sent via my website, using a similar name format as above. I’ve cleaned up the spelling and grammar enough so that you don’t sit scratching your head for 20 minutes trying to decode the message, and this is what it said. Naturally, I replied with: “Thanks for that. Hope you’re well. Love, Barry” but the email bounced back to me as undeliverable – whoever had sent the message had used a false email address. The annoying thing is, The 13th Horseman doesn’t make a mockery of anyone (well… maybe Pestilence), and had they actually read the book they would have realised that fact. The Book of Doom, on the other hand… well, let’s just say I’m bulletproofing my windows now that that one has been published, lest I be violently killed one day in the name of peace, love and goodwill to all men. Secret government unit Department 19 is recovering from evil vampire Valeri Rusmanov's deadly attack on their base. The Department’s newest member, teenage operator Jamie Carpenter, is tasked with training up a new squad, as his friends and colleagues desperately search for ways to try to stop what is coming. The timing couldn't be worse for a coordinated, global attack on a number of maximum security prisons and hospitals—with the already-dangerous inmates now on the loose and turned into vampires. One of the escapees has a deep connection to one of the darkest moments in the history of Department 19 and embarks on a quest that threatens to expose the existence of vampires to the public. And with each day that passes, the regenerated Dracula gets stronger, bringing Zero Hour closer. In this third instalment of the epic Department 19 series, Will Hill delivers higher—and sharper—stakes than ever before. If you're a long time reader of The Book Zone then you will know just how big a fan I am of Will Hill's Department 19 books. The first book was my Book of the Year back in 2011, and the sequel, The Rising, would most likely have been the winner in 2012, if I hadn't been a little flexible with the rules (seriously, it's no fun when the same person wins year after year - just ask Christiano Ronaldo). If I now say that the third book in the series, Battle Lines, is my favourite to date then you may feel you don't need to read any further as you will know that it must be a damn fine book indeed. If you have not yet read the first two books in the series then shame on you. However, you may not want to read on as although there will not be any spoilers for Battle Lines in this review, I really cannot promise the same for The Rising, so please navigate away now. Battle Lines opens with the members of Department 19 still recovering from the catastrophic, bloody vampire attack on The Loop that took place at the end of The Rising. Cal Holmwood has assumed the position of Interim Director following the abduction of Henry Seward by Valeri Rusmanov, and one of his first commands was to disband G-17, Jamie Carpenter's Operational Squad that also included Larissa Kinley and Kate Randall. His reasons, although difficult for Jamie to fully accept, make perfect tactical and operational sense: by splitting the trio up their experience can be used to greater effect. Thus, Jamie is put in charge of a new squad of trainee Operatives, Kate has been transferred to the Internal Security Assessment Team (ISAT) to work with Paul Turner in rooting out any traitor that might still be hiding amongst their ranks, and Larissa is on secondment with NS9, Department 19's sister organisation in the US. Meanwhile, their other friend, Matt Browning, is working all hours in the depths of The Loop on Project Lazarus, the department's quest to find a cure to the vampire plague. However, before all this is revealed we are treated to an vicious opening chapter that grabs you by the throat and tears out your carotid artery. It is an opening chapter that I found all the more chilling because of where I live. It starts with a siren waking up the residents of the village of Crowthorne. For people who live in the Crowthorne area, which includes Bracknell where I live, the sound of the siren is something residents do not want to hear outside of its weekly Monday morning 10 am test. It is a siren that I can hear if I am outside at this time whilst at school almost ten miles away. It is the siren that signals an escape from Broadmoor, the high-security psychiatric hospital that through the years has housed the likes of Ian Brady, Peter Sutcliffe, Ronald Kray and Charles Bronson. However, in Will Hill's world the inmates aren't just escaping - they have been given a helping hand by Valeri's minions that has given them powers that have previously only been seen in the oldest of vampires. I'm now conscious that I have written two lengthy paragraphs and not got beyond the first couple of chapters, and there is so much that happens in this book. As a result of Jamie's original team being split up, the action moves from England to the US, and back again in rapid fire, with every one of the main characters being given the wordage to grow as characters in their own right. Jamie has to deal with taking inexperienced Operatives into the field against merciless foes, Kate has to cope with being seen as some kind of pariah as she carries out her internal affairs duties in interrogating her fellow D19 members, and Larissa has to cope with being thousands of miles away from Jamie, whilst having the time of her life in a set-up that offers her more freedom and less prejudice, but also having to fend off the advances of one of hew new friends. We are also occasionally treated to an insight into the machinations of Dracula and Valeri as they inflict horrible tortures on their captive, Seward. I'm not going to prattle on for much longer, although there were two scenes I want to mention, however obliquely, that had me grinning from ear to ear. The first involves Larissa, when she and her team are tasked with an operation that brings them into contact with a Mexican drug cartel. If you have read the D19 books you will know what Larissa is capable of - imagine her let loose in such a situation and I imagine your grin of anticipation will match my own. The second scene I'd like to mention appears on page 570. I was reading it during one of the Y7 reading lessons I take at school, and I literally made my group jump as I shouted "Yes!" out loud, and only just managed to hold back from pumping the air with my fist! Battle Lines hit me on an emotional and psychological level more than its predecessors, and is all the better for it. One scene in particular, when Larissa is in a Vegas night club, is thought provoking for both her and the reader, and later conversations suggest that what on the surface seems like little more than a brief encounter of little consequence may prove to have significant ramifications for Department 19 in the future. Readers also have to cope with the heartache that Matt and Kate's fathers continue to face, believing that their children are dead, and the steps they decide to take that could bring down the whole Department. On top of all this, Dracula is still very much on the fringe of the main story (exciting times ahead!) and I haven't even mentioned Jamie's dad or a rather bitter, and now extremely violent and revenge hungry, character from the Department's past. Prepare to be blown away! Is there no limit to Will Hill's talent as a writer? He continues to up the ante with every new release (as well as upping the litres of blood that flow throughout), and every book so far as beet better than the one that preceded it. With two more books due in the Department 19 series I fully expect him to be wowing his established fans for another two years, whilst also attracting legions more into the fold. Battle Lines is scheduled to be published on 28 March, and my thanks go to the lovely people at HarperCollins for giving me the chance to read it some time before release date through Netgalley. Ash Mistry is leading a pretty complicated life. There’s school, his unrequited crush on girl-next-door Gemma… and then there’s the fact that he’s the reincarnation of the great Indian hero Ashoka, not to mention the small detail that he died last year, and came back as an agent of the goddess of death. Here starts the campaign to persuade Goodreads to have a six star rating system. Looking back over the year so far, and bearing in mind that we are not even a quarter of the way through 2013, I have already given fourteen five star reviews to books with a 2013 release date. This is not me being overly generous - there are simply that many great books being released this year. However, to hijack Orwell's famous Animal Farm quote: All five star reviews are equal, but some five star reviews are more equal that others. Thus the need for that extra star, perhaps only awardable after a month has passed since first rating a book. Does it still stick in the mind? Do you find yourself looking longingly at it on your shelf, wishing you had the time to re-read it? I am finding this with a small number of those five star 2013 reads, and Ash Mistry and the City of Death is one of them. Long time readers of The Book Zone will know that I have been a fan of Sarwat's writing ever since I first read Devil's Kiss, and his second book, Dark Goddess, was my Book Zone Book of the Year in 2010 (trophy finally made a ready to be delivered). I also loved Ash Mistry and the Savage Fortress, and it was one of my favourite books of 2012, so I have been waiting impatiently for the sequel to be published, and it was well worth that wait. This book is blinkin' brilliant from beginning to end! My thoughts about the importance of Ash Mistry and the Savage Fortress as a book are unchanged a year on from when I read it and there's not a great deal I can add to that, so please head on over to my review here to find out why I feel this way. However, for those of you who have arrived here looking for more information about the sequel then please read on. The story has moved on a few months and Ash is living back in London with his family, trying to return to life as a normal school boy, with normal school boy problems, whilst also coming to terms with the fact that he is now the reincarnation of an ancient Indian hero. Ash has fallen badly for Gemma, one of the cool, popular crowd at school, and hearing she has split up with her boyfriend spurs him to make a move. Unfortunately, just as he seems to be making some headway, Parvati (demon daughter of Ravana) arrives on the scene with a favour to ask of Ash, and then soon after everything hits the fan, in the shape of Jackie, Lord Savage's right-hand she-demon. Nasty things happen, and instead of being seen as a hero, Ash sees fear in his friends' eyes when they look at him. With persona non grata status now firmly established and life in London totally unbearable Ash decides there is only one course of action for him to take: join up with Parvati, go back to India, kill Savage, get his revenge and save the world (again). After all, he is the Kali-aastra, master of Marma Adi and able to kill any living creature with the slightest touch of his little finger. Little does he know that his mission will not be quite so straightforward as Savage has managed to master a little more magic since their last meeting, and suddenly Ash is not as invincible as he thought. He also finds himself coming face-to-face with another old adversary, this time in the shape of Ujba, who now wants to continue the training that Rishi began with Ash. Add these woes to the fact that Ash still does not know what Parvati's true motives are, and whether he should trust her or not, and the stage is set for one hell of a second half to the book. The climax to the book is typical of Sarwat Chadda - full of action, fights to the death, and more twists and turns than a Chubby Checker dance marathon, and you're left feeling pretty breathless come the end of the penultimate chapter. However, just as you thought you could relax Chadda plays the ace that he has kept hidden up his sleeve and leaves you with a jaw-to-the-ground-OMG-can't-believe-it final chapter that had me rushing to get online to check when the third book in the series is due to be released. Fortunately for Sarwat we only have to wait until July for this one - if we had had to wait a whole year then I may have been going fully tooled to his book launch to get all Ash Mistry on him until he revealed what happens next. 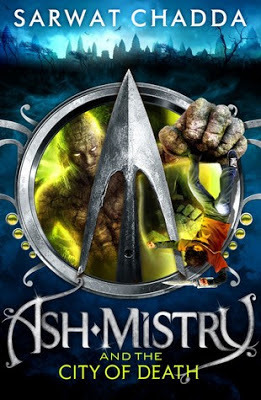 If you have/are a 9+ boy who loves Rick Riordan but has not yet discovered Ash Mistry then I simply cannot recommend the books enough. They are quite dark in places, and also occasionally gory (perfect for boys then), but also come laced with humour. The plot is super-fast paced, and I raced through the book, reading into the night as I couldn't put it down. Ash is a superb main character - even though he has muscled up since we first met him at the beginning of Savage Fortress, inside he is still a geeky, RPG playing kid from London, with all the insecurities that come with being that age, and I think kids will find it easy to relate to him, and also wonder how they would cope if suddenly they found themselves to be masters of ancient magics. Ash Mistry and the City of Death was published on the 28 Feburary and my thanks go to HarperCollins for sending me a copy to review. Back on the 28th February I happened to happened to see Will Hill tweet that the first in his Department 19 Files short stories was available to buy in the kindle store. I am a huge Department 19 fan, and have loved all of the novels to date (including Battle Lines, which I was fortunate to receive as review copy. It is even better than the previous two novels). 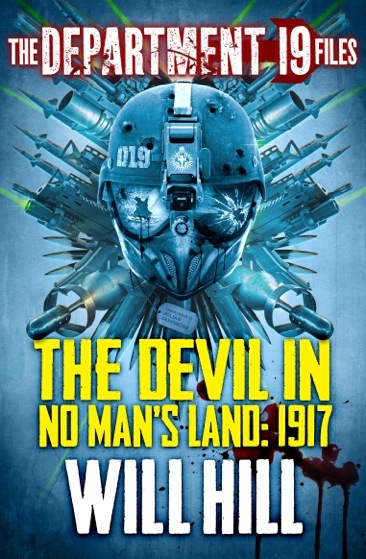 Needless to say, I have been looking forward to reading the new short stories ever since I first heard they were going to be published, and within seconds of Will tweeting it I had downloaded The Devil In No Man's Land: 1917. And I loved it. If you are as much of a D19 geek as I am then this is an essential purchase. 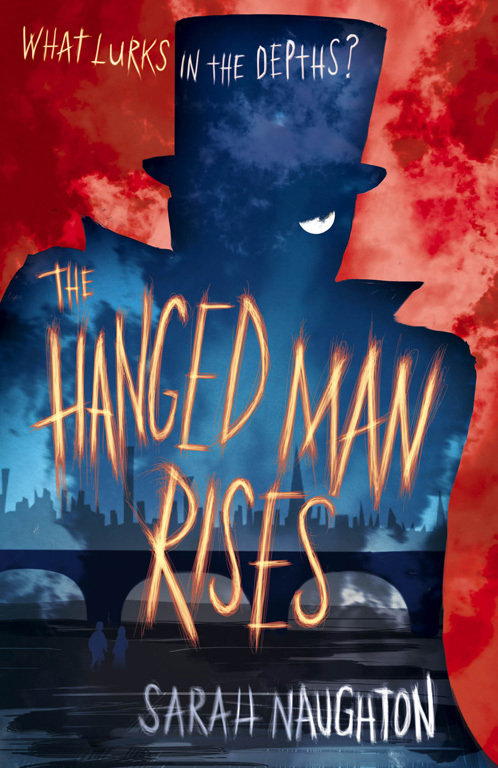 Set in 1917, it focuses on the exploits of Quincey Harker during the Great War. Readers of the books will know that Quincey Harker was a prominent figure in the early years of Department 19's existence, but we know very little about his rise to 'fame' within the Department. In this short story, the author starts to fill in some of the back story, we discover that he was the leader of an elite group soldiers (what today we would call special forces) and more importantly, how Harker came to 'meet' his first vampire. 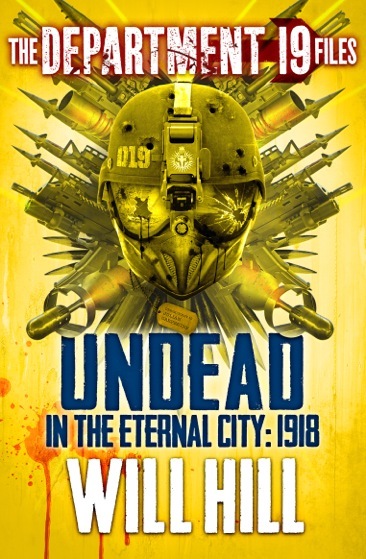 Needless to say, one week later I took my Kindle to school with me as I had preordered the second story in this mini-series, titled Undead in the Eternal City: 1918. This time Harker and his elite group of fighters are enjoying a little R&R in Rome following the end of the Great War. However, they are not alone in visiting the Eternal City: another 'person' familiar to D19 fans is also at large - none other than Valeri Rusmanov. 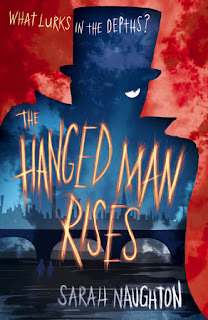 This story is very different from the previous one which focused on the horrors of the Great War, and the terror experienced by Harker and his team as they encounter their first vampire. This time the group react in the way they were trained to when faced with a foe, and what ensues is a full throttle chase though the sreets of Rome. It also may go some way to explaining Valeri's extreme hatred for all things Department 19. 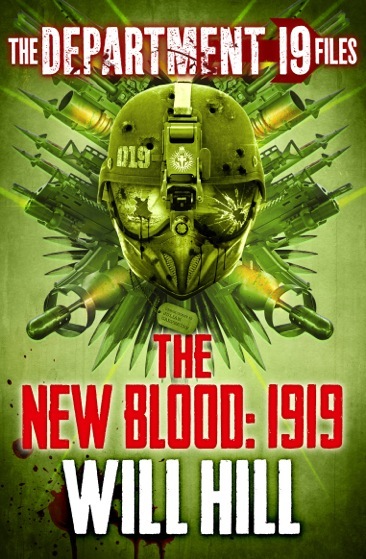 I'm now waiting impatiently for Wednesday to come along again so I can read the third in the series, The New Blood: 1919. A word of warning - these are short stories so don't expect anything lengthy. Also do not expect any big revelations that impact on the novels - these are just brief, but very satisfying, looks at a character from D19's past. 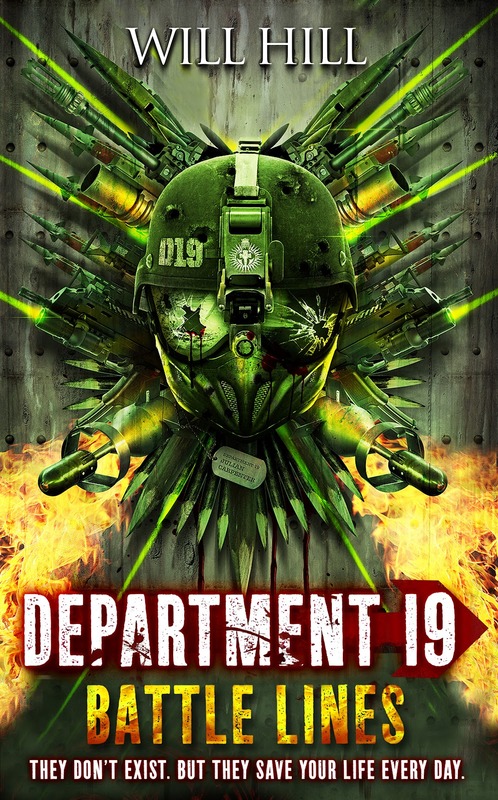 What you will get though are well-written, bloody anecdotes from the D19 annals that may answer questions you may have about the early days of Department 19. It is well worth popping over to Will Hill's blog at http://www.willhillauthor.com/2013/02/the-department-19-files/ to read a little more about the background behind his writing of these stories. There is one more short story to come this month, and I would imagine that if these are successful then the author may produce even more in the future. How many survived the zombie apocalypse?Where do the living hide in a city of the dead? Who controls the streets of London? Warning: this review will probably contain spoilers for Zom-B and Zom-B Underground so do not read on if you haven't yet read these two books. Before I say any more about the content of Zom-B City there is one burning issue that I want to focus on and that is some of the negative reviews that the first couple of books may have attracted. Now I am a firm believer that everyone is entitled to their own opinion, and naturally given their content these books will definitely not be to everybody's taste. However, some reviewers have made negative comments based on the incompleteness of the story and their feelings that it leaves the reader hungry for more. Durrrr! Surely that is the point? These books were written to be episodic in nature - sort of a literary form of the old Universal and Republic serials, designed to leave readers clinging onto the cliff by their fingernails, desperate to visit the cinema the following week to find out what happened next to Flash Gordon/Zorro/Jeff King/Crash Corrigan/etc. It's not as if readers have to wait a whole year for the next instalment, unlike many series books these days. With one being released every three months I think the books fit this strategy perfectly, and it's a great way to engage reluctant readers, although my one small concern is that some parents may find the hardback price a little prohibitive. In Zom-B City we see B emerge from the underground military complex as the only survivor following the zombie attack of the previous book. B finds herself in a seemingly deserted East End, deserted that is except for the numerous reviveds that now wander the streets looking for food. These mindless zombies ignore B once they realise that B is dead just like them, leaving her free to roam unmolested. Once she has kitted herself out with new gear she starts to walk tall, even giving herself the tongue-in-cheek title of Queen of the City. However, she is brought back to earth with a bang as she quickly discovers that there are more than zombies on the streets, although some of these uninfected may just be as inhuman in their actions as the brain chomping reviveds. One of them in particular, although not a threat to B, comes across as more than a little crazy given his rather gruesome hobby. I'm still wary of creating spoilers but I will say a couple more things, as I know there are fans out there who will want to know this: Mr Dowling the clown is back, and even more nasty than he was described in Zom-B Underground (Shan's gory imagination runs riot with this character); and also, two simple words..... Owl Man!!!! At just 213 pages and including more of Warren Pleece's excellent illustrations this is yet another quick read that Shan fans will fly through, especially given the furious pace of Shan's plot. I read somewhere that Darren has stated that the first three books are very much setting the scene, and the fourth is where the story really kicks off. I can't wait, and luckily for lil' old impatient me the next book, Zom-B Angels, is scheduled to be published in June so not long to wait. 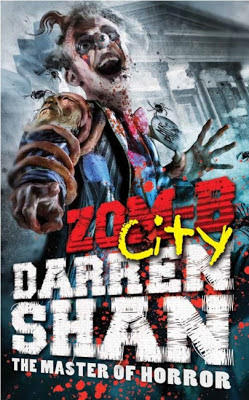 Zom-B City is due to be published on 14 March and my thanks go to the lovely people at Simon and Schuster for sending me a copy to review. Everybody knows bad things happen in London. Really bad things. Things that if you saw them happen for real you’d have traumatic stress disorder for the rest of your life, but somehow reading about them in books makes them not only bearable but positively delicious. I’m a total coward. It would be nice to think I’d be one of those people who steps into a fight and stands up for the kid about to be pulverized, but actually I’d be more likely to duck into Tesco Metro and become very interested in the salad counter. If I got mugged I’d hand over my mobile, my wallet and my keys without a peep, then throw in my shoes for luck. Sounds sadistic, doesn’t it? Don’t get me wrong, I like Titus. He’s brave, determined and fiercely loyal. But to reveal the potential of all those characteristics he has to go through some really tough times. He has to deserve his happy ending (if he gets one…). Because its only when we’re put under extreme pressure that our true characters come out. Who knows, in a plane crash I might be the one to dive back into the inferno and haul the baby from the jaws of death. Or I might just be the one who tramples on your head to get to the exit. With a bit of luck I won’t ever have to find out: I can be both. When I feel like being virtuous I just read about Sam Gamgee or Joey the war-horse. And if I’m feeling villainous, I can revel in a Darren Shan or a Horrible Histories. Three guesses which I prefer.